First off, I am excited to say that I have a post up over on FITBLOGGER. If you get a chance, please go check it out! It's about running, naturally. _______ And now, back to our regularly scheduled post. For all that I did have some cons for this race, the actual running of the race itself was pretty good. The course was well marked and mostly flat, there were several aide stations and the volunteers were awesome. However, the parking was not. I opted to drive to this race, because, although I could have walked (5 miles each way), I did not want to do so and then race and then have to walk back. So we drove. Mr. Lovely came with me and spent the time doing research and drinking coffee in a local coffee shop down the street. We got there with plenty of time to spare, but it took us probably 15 minutes to find parking, which was not very close, probably about a mile and a half from the start of the race. By the time we got to the start line, I had to use the restroom, but it was about 10 minutes to start time and the line was L.O.N.G. I got in it anyway, just to see if I could make it. I did, but the race started while I was inside, so I got out of there fast and ran to the start line just in time to....stop short. The crowd was not moving. Well, it WAS moving, but very slowly. I crossed the start line and started doing the weave of death. I must have passed a couple hundred people before the path widened to one lane of a two lane road. I started passing people on the left, which was also to the left of the cones, and I got yelled at a few times by the local police (MAM, stay to the LEFT of the CONES!!!) I swear I passed another hundred thousand people but it was hard going. It wasn't until about mile 3 that it started to get to a point where it was easier to find my pace and pass people. My goal had been to stay below a 7:40 pace in order to get a 1:40 finish, but after the first few miles, I noticed I was going a little faster, so I resolved to stay under a 7:30 instead. After mile 3, there was one girl that was pretty much running at the same pace as me, so I would follow her, then she would slow a bit, and I would pass her, and then I would slow a bit and she would pass me. We did the "dance" for a while before she slowed down to about a 7:40, and I passed her and didn't see her again. After mile 6, the crowd was pretty thin. It seemed like I could see the start of the pack way up in front of me. At this point we were running along the bay and it was beautiful. I decided that I would try to pass one person each mile, of course at the same time trying to maintain approximately a 7:30 pace. Mile 7, I passed a couple of people. Mile 8, one person. Mile 9, 3 people. I maintained my 7:30, even though it was getting hard. I remember hitting mile 8 and thinking (with my limited math + running skills) that I was almost done, but then realizing I still had 5 miles (5! How did that happen?) left. Mile 10, 11 and 12 went by pretty slow. I could see the front few girls in front of me. From what I could see, there were three. I passed one during mile 10, one during mile 11 and really pushed to get the one at mile 12 (I was really tired by now)! Thank goodness for two things (a) the view -- I can see the city and the bay and the headlands in the distance, and (b) the spectators -- there are people all along the route cheering. They really lift my spirits. Although my hamstrings are still killing me. I didn't know if I was first or not. Then I saw her. A girl waaaaay up in front of me. I wonder if there are more like her? Darn it. I cross the finish at 1:37:17. A new PR. I look for the race results. They are not posted. The MC says that they are online. They are not. I need to know! Unfortunately, they did not get posted online until late that night. Also unfortunately, there was a hidden posse of girls ahead of me. The Verdict? 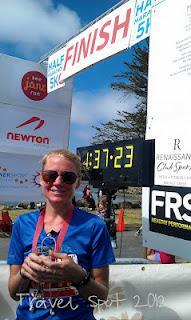 I ran this race to see if I REALLY have a chance to BQ. I don't want to have unrealistically high expectations when I really need to just keep training and wait until next year. I don't want to let myself down. According to the McMillan Pace Calculator using this race time, I should be able to run a 3:25 marathon. That means 7:50 pace for 26 miles! I am still unsure (read: scared of failure). But I am working on it! Are you scared to try things sometimes because you are afraid of failure? How do you talk yourself into it or have confidence in yourself during times of doubt?